LONDON - BSkyB has managed to add 80,000 new customers in the three months to the end of March despite many consumers cutting back on spending. Sky now reaches more than 9.3m households. Of those, 15% are signed up to all three of its services including TV, broadband and land line. Analysts had forecast it would gain about 50,000 to 60,000 customers in the quarter. The satellite broadcaster has upgraded 243,000 of its customers to its high-definition service after it cut the cost of the HD set-top box. It now has more than 1m HD customers. Broadband growth slowed over the quarter, with 130,000 added in the three months to end March, compared with 229,000 in the same period last year. Sky has just over 2m broadband users. Earlier this year Sky pulled out of talks to buy rival internet service provider Tiscali's UK business. It is thought the purchase of the company would have made it the number three provider in the market behind Virgin Media and BT. 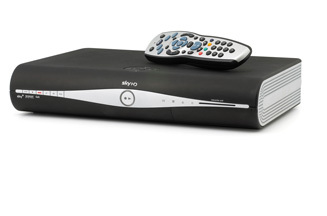 Sky's HD service was the driver behind strong growth in new customers for Sky+. It increased by 55% year on year to 406,000. Over half of the total customer base use Sky+. The company announced plans in January to hire an additional 1,000 staff as part of its push towards HD television. Third-quarter revenues rose from £1.25bn to £1.39bn, while profits increased from £56m to £63m.